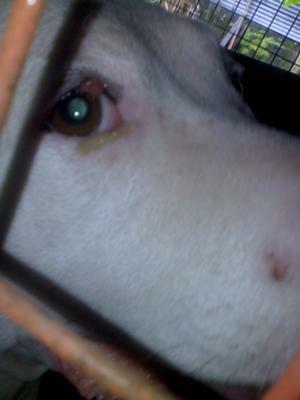 His this dog eyelid swollen ? What can we do for a home remedy? I’m afraid I don’t have enough information to tell you what exactly you might be dealing with on your dog’s eyelid. It looks like he might be an older individual if that is gray hair that I see on his face. 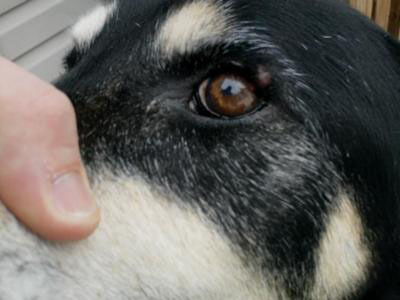 Older dogs do commonly get benign tumors that affect the glands of the eyelid, so that is one possibility. If the mass is growing or bothering your dog, do get him in to the vet for a check-up. If it seems to just be sitting there not doing much of anything, keep a close eye on it (no pun intended). I’m not sure any over-the-counter medicine is called for or would help the situation. If it is a benign eyelid tumor, surgery is the only way to get rid of it. 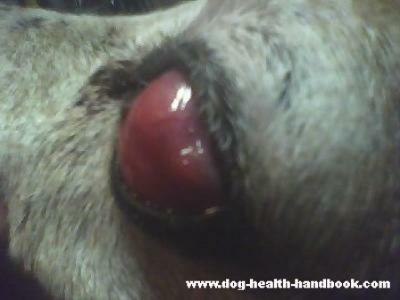 Is this a dog eye tumor? Don't really know what happened to my dog's eye but it seems from the looks of it, and according to your articles, it somehow fits the billing of a dog eye tumor. What steps should I take regarding the removal or treatment of the said tumor if I can't really afford surgery (worst case scenario). Animal surgery including surgery for dogs is not as popular in my country (Philippines), although there are some who practice veterinary medicine. Clinics are available, but not everyone can afford or would prefer hospitalization for their pets. It would help a lot if the above mentioned problem would have a lasting and helpful solution other than surgery. 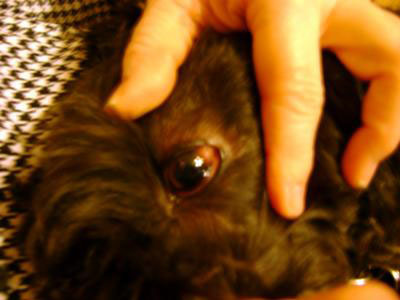 Dog eye tumors may be either benign (enveloped) or malignant (spreading) in nature. The exact cause of canine eye tumors are not yet known, however, genetic and environmental factors have been proven to be linked to the occurrence of these types of eye tumors in dogs. Adenomas are the benign form of dog eye tumors, while adinocarcinomas are malignant tumors commonly found around or below the eyelashes. The picture suggests that your dog is most probably suffering from a benign form of dog eye tumor, which is found below the eyelashes. In any case, one can never confirm the exact condition with the help of just a picture or description. A detailed eye examination is needed along with several advanced laboratory procedures, because in many cases a simple inflammatory response to the eyelashes or any other infectious or non infectious condition that affects the external eye can be misunderstood as a dog eye tumor. It is therefore always recommended that confirmatory tests be performed before deciding on a possible treatment. If it is an eye tumor (benign or malignant), surgical excision is the only specific and effective treatment. Any other treatment, including anti cancerous medication plans might not be able to treat the condition completely. Tumors below the eyelashes are mostly benign in nature and cause irritation and discomfort to your dog, which can lead to secondary problems including the complete loss of eye function. It is therefore recommended that if you are willing to specifically treat the condition, go for confirmatory tests and get the tumor excised by a qualified veterinary surgeon. All other treatment approaches address the symptoms of the problem by providing added support to the dog eye physiology (condition). Here, though we are unable to confirm the exact condition, we can suggest some supportive/symptomatic treatment plans for your poor dog. While we cannot prescribe specific anti-cancerous drugs, we can suggest some natural remedies and eye-cleansing tools, which will help to minimize dog eye discomfort and irritation. Natural remedies such as Eye-Heal will help to reduce any chance of dog eye infections, which are common secondary complications of dog eye tumors. You can also use the remedy C-Caps to help boost your dogs immune system and cell strength. To clean the eye we suggest using R-7 Eye Wash Pads. You can use the natural remedies for long term care and as a support for your dog’s eye health, but remember this is not the specific mode of treatment. The only effective treatment available at the time being is surgical excision of the tumor, followed by supportive and post-surgical care. Description of the problem: 1 month ago blister like sore occurred on the eyeball but does not seem to have increased in size or cause pain. medical history in terms of past or recent diseases: reoccurring ear infections and allergies that cause skin sores on belly and under arms. I can’t really say what the mass on Kelso’s eye is based on your pictures and description. It could be a dog eye tumor, but I’d say given his age, cancer is not very likely. Other possibilities include a cyst, abscess (a pus-filled pocket of infection), or a granuloma (a solid area of infection or inflammation). Trauma to the eye could also cause something like this to form. Your veterinarian might be able to tell you what it is by simply looking at the eye with an ophthalmoscope or by performing a few simple tests like numbing the surface of the eye and then touching the mass with a microscope slide or gently scraping away a few cells and then looking at them under the microscope. Since you’ve given it a month and it hasn’t disappeared on its own, it is probably time to get it checked out. I adopted my Basset at the age of 3 yrs. He is now 11 yrs old. He went to the vet before I adopted him and was diagnosed with having dry eye. He is neutered. Artificial tears and or moisturizing eye drops are given daily. He lost the vision in his left eye first and then 3 to 4 weeks ago, this eye growth or tumor started. It began by looking like "Cherry eye." The growth has now continued to grow where it now almost completely covers the entire eyeball. He is scheduled to have surgery for removal of the growth and possibly the entire eye on Tuesday, January 25th. I work for a basset rescue and care for 106 dogs currently at the rescue ranch/shelter. My boss took him for his first exam where he was put on the surgery schedule for this next week. I was not able to get the time off to take him myself. I am scared as to what this growth is. Have you ever seen anything like this or can you tell me what kind of tumor this is by the pictures I've included? He has been healthy in every other way. Unfortunately, I cannot tell what the tumor is based on a picture. Your plan to take care of your basset’s problem sounds right on track to me, though. Run a few tests prior to surgery (e.g., chest X-rays and blood work) to make sure that surgery is in his best interest, remove the tumor, and send it to the pathologist to find out what it is. This will let you know what your boy’s prognosis is. Maybe the surgery will completely remove the mass and he’ll be cured. If not, you’ll know what to expect and if there is anything else you can do to help him. My thoughts are with you and your beautiful basset. Please update us on your dog's condition.